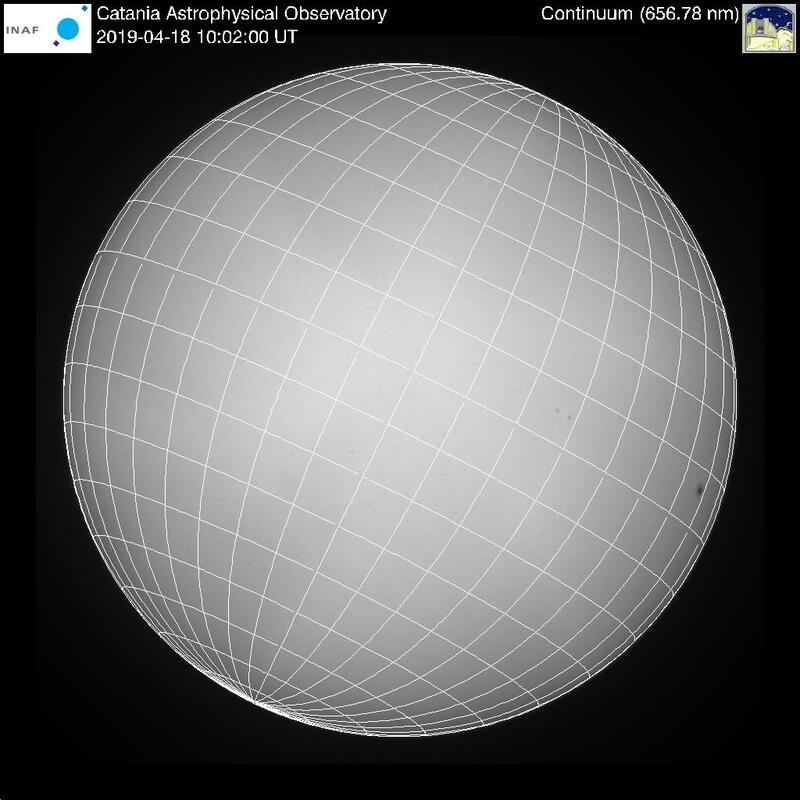 The image shows the latest continuum image of the Sun acquired at INAF - Catania Astrophysical Observatory with a quality index equal to 1 (1 =good, 3 = bad). This image has been taken at 656.78 nm ± 0.25 nm near the Hα line. Although it has been obtained by means of a Lyot filter, it provides a view of the solar photosphere as the white light images acquired by other providers/instruments. When the weather conditions permit, every 60 minutes a full disc image of the Sun in the continuum (656.78 nm ± 0.25 nm) near the Hα line is displayed. The raw images are recorded with a size of 2200 x 2200 pixels and a digital resolution of 16 bit. The display is refreshed every minute. The spacing of meridians and parallels is 10 degrees. The image has been preliminarily reduced in order to check its quality and to centre the solar disc. No flat-field correction has been applied. The observations in the continuum are carried out between 8:00 and 14:00 local time (CET/CEST).